Carema is truly an incredible place characterized by terraces build from dry stone walls and filled with soil brought up from the bottom of the valley by hand. 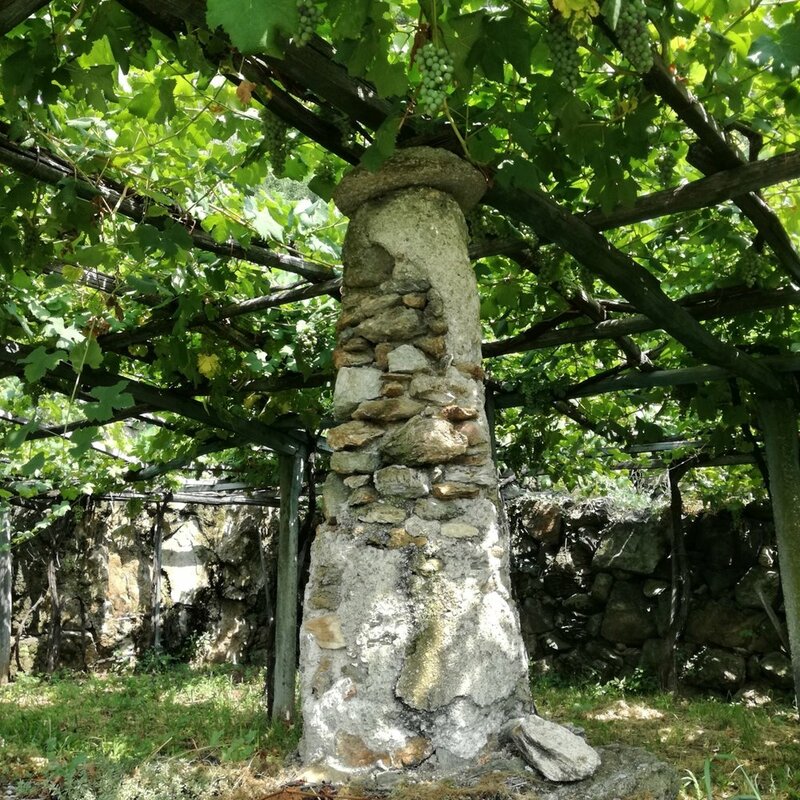 Pillars having the shape of a truncated cone are made of stone and lime - they line the terraces and provide support for the vines in a pergola system that keeps the vines high - protected from the cold winters as well as allowing circulation for the grapes. These truncated cones ('topie') also have another very important function. The stone heats up during the day and releases its warmth overnight, helping maintain a milder microclimate among the vines. 35 acres of vineyards makes Carema one of the smallest wine regions in all of Italy. It is certainly the highest altitude vineyards in Piedmont, and some of the highest in all of Italy. To be Carema DOC, the vineyards must be 300 to 600 meters (close to 2,000 feet) above sea level. The village is home to less than 800 people. Federico and Deborah Santini are among the few returning to this incredible place to revive and keep the traditional ways of making wine. They grow Nebbiolo as well as Neyret, Pugnet & Ner d'Ala (local red grapevine varieties, widespread in the Canavese and Pre-Alpine areas). The vines are 50 years old and are trained by ‘pergolas’ (‘topie’ in local dialect). Due to the steep terraces, all vineyard work is done by hand. This truly is a labor of love!